Although a difficult question to answer, it’s hard to pass up the lovely plantain weed (Plantago major or Plantago lanceolata). Nope – this is not a banana! I’m talking about the green weed that you’ve seen everywhere but may not have recognized. It is quite simply one of the most prolific weeds on the planet. Native Americans actually referred to it as “white man’s footprint” because it seemed to spring up everywhere the white man went. I first became acquainted with plantain as a beekeeper. It is my favorite “drawing” herb. Since it is found almost anywhere you go on the planet, it’s a fair bet that you will find it at your feet when you need it. Getting stung as often as beekeepers do, we need a reliable plant remedy. It’s easy to create a quick poultice from fresh leaves to pull out the toxins from a bee or wasp sting. For the first couple seconds it hurts a bit more as it precipitates the proteins in our cell walls and causes constriction and tightening. But as the cells tighten, they expel the venom. This even works if we let the sting go untreated for a few days and the area has gotten hot, red, and itchy. So What is a Poultice anyway? A poultice is made of fresh or dried plant material. A simple example would be a plantain leaf poultice. Just chew up a bit of a leaf and stick the pulpy mass on the affected area. Be sure to remove the old and add a new one every once in a while. The toxins will pull into your poultice and you don’t want to continue to irritate your skin. What Are Some Other Ways to Use Plantain? On the farm I use plantain powder (find it here) as the poultice component of a kit I make to pull the oils of a poison ivy rash or the toxin of a mosquito bite out of the skin. Instead of digging around with tweezers when one of my kids gets a splinter, I chew up a plantain leaf and cover it with a bandaid. In no time at all that splinter is sitting on the skin surface ready to pick up. When a cut gets out of control and there is deep infection, a poultice of plantain will pull out dirt and germs so the wound can heal. Spider and mosquito bites can be nasty. My father was bitten by something particularly nasty last year and was hugely swollen. In the case of venomous bites and stings it is helpful to apply a poultice while also drinking a plantain tea. Surprisingly, plantain is also nutritious and delicious! Plantain contains beta carotene (the precursor to Vitamin A), calcium, monoterpene alkaloids, glycosides, sugars, triterpenes, fixed oil, linoleic acid and tannins. Its seeds are high in mucilage which, when eaten, makes them effective as an aid to reducing LDL cholesterol levels and triglycerides. This mucilage also makes a great bulk laxative. In fact, the plantain we find here in the Midwest is a relative to the European variety that is used in Metamucil. Using the leaves in food or medicine can be helpful for sore throat, gastritis, diarrhea, bronchitis, fevers and general inflammation. It is a mild diuretic so it is helpful in kidney and bladder disorders. It is considered an alternative as it helps the liver to filter our blood and it is also one of my favorite herbs to help clean an overburdened lymphatic system. This weed is best in salads and casseroles when the leaves are young and small in the spring. Chewing these tender fresh leaves puts one in mind of a delicate mushroom flavor. As we drift into summer the leaves will get more woody and tough and it is appropriate at that time to dry for winter soup and tea use. If you would like to harvest plantain you’ll find it’s easy! The leaves can be picked just about anytime, though they’ll be the best in early spring or just as the flowers begin to form. Make sure that wherever you harvest is free from chemical spray or contamination. Can’t find any plantain in your area for harvesting? DIY Natural recommends getting organic plantain leaf here. Have you ever used plantain for anything? I found this interesting. But my concern is that my children are allergic to plaintain. I am not sure if it is the pollen or the plant. Have you heard of this? Does that mean they can’t use the remedies? This all depends on how badly they are allergic. If they tend to get hay fever like symptoms when they breathe in the pollens, it may be worth a try. To be safe you could mash up the leaves and apply them on the skin and see if there is any reaction before trying it internally. I have read in survivalist books that the Plaintain also makes an excellent peanutbutter-like alternative. Equal parts of the dried/roasted seeds with butter is more nutritious than peanuts. That is FASCINATING! Thank you so much for sharing… now I am inspired to try that out! Thank you! I had no idea this ‘weed’ had such properties! 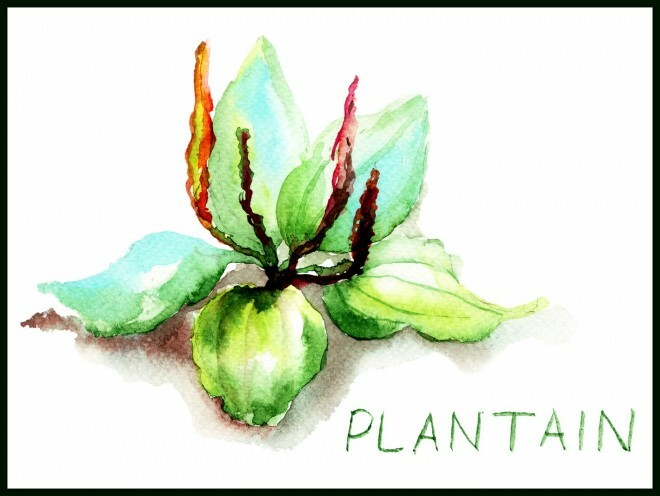 I grew up using plantain for wounds when playing outside, as my grandparents taught me of its medicinal properties. When I checked in with its spirit as an adult, after opening to our abilities to communicate with plant spirits, it showed me that it loves hearing laughter in the sunlight, so it loves to hear children running around & playing. It loves to share in joy, & often sees children’s laughter as being like a bubbling, rollicking stream. I thought this might be a neat thing to add, in tandem with all the wonderful herbal information. This is GREAT information! I have this weed growing all over on my property, but didn’t know what a beneficial plant it is! Interesting thing is, it is plentiful in my chicken pen, but it’s one of the few grasses/weeds that the chickens don’t eat. I wonder why that is? Do they know how powerful it is? Wait until the seeds develop! I don’t know why they would avoid the leaf, but I know they’ll eat the seeds. Our chickens compete over them! When I was about 8 or so (I’m 63 now) I was playing by our barn and there were some board in a pile which I thought I could climb. Rusty spikes etc. Well..I jumped on a board and a rusty spike went right up into the arch of my foot. My Gandpa who lived with us, got a leaf and put it on my foot and put tape over it. He changed it often, but it pulled all that rust and dirt out and healed udp find. He called it a pig leaf. Glad to find what it really is called. It’s great. Hi..love the article..where can I get organic plantain seeds to grow my own! Beyond the usual uses, I have also put it in my shoes when taking long walks or hikes to prevent or heal sore feet. In the late 50’s, early 60’s , most people had a parakeet inside. This was before weed killers were commonly used, and every yard had some stalks of this appearing in summer. We picked these seed stalks for our parakeets. Then one year a friend fed one which had been sprayed to her bird and the bird died. I can’t believe you never mentioned its use for respiratory problems. Plantain is long known as a herb for the respiratory system. I use this as one ingredient in amazing cough mixture brew. I grow a small plot of mixed lesser and greater plantain and harvest the leaves, flowers and seeds and chop them roughly and put in a jar. I then cover them with alcohol (usually vodka) and leave it to macerate in a cupboard for at least a month. This becomes a tincture which I drain off and squeeze out. I then bottle the liquid in dark bottles and use it for skin conditions with selfheal, but mainly in my cough mixture. Spending summers on my aunt and uncles farm, all of us would get scraped and cut from time to time. We always reached for the “band aid plant” and would press it on the spot and changed when it got wilted and started falling apart. We never ran to Mama with a skinned knee. Band aid plants are everywhere. I have loved them forever! Love, love, love plantain! Thanks for this wonderful article. In addition to using it outdoors for bites or stings, I also infuse in it olive oil to use in skin soothing and healing salves. I also dry it and use it with other vegetables and herbs when making soup stock. Thank you for the wonderful information! I’m wondering if it is still safe to harvest the leaves and can you make your own powder. 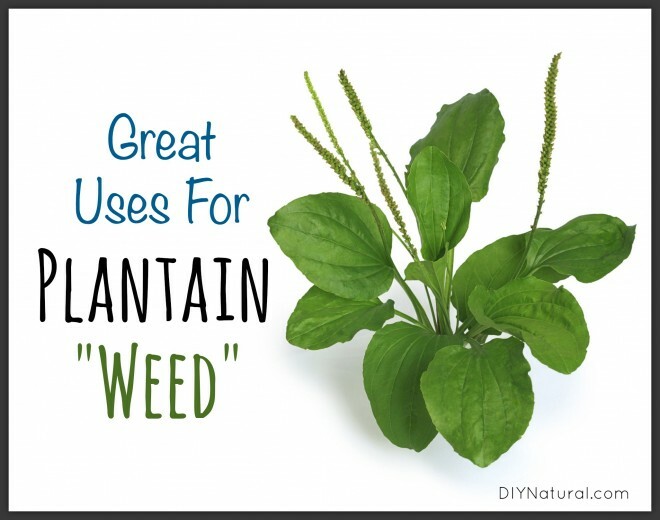 Do you know if you can cultivate plantain? How can we make a tea? I apologize for allow the questions but am new to using herbs and we have an abundance of plantain on the side of our driveway 🙂 thank you. Yes, you can still harvest though the BEST time to harvest is just before the flower develops. Yes, you can cultivate it… we have grown it in garden rows before! You can dig and transplant the ones along your driveway if you’d like. To make a tea, use 2-3 tsp per cup of water of dried leaves or 3-4 Tbsp fresh leaves, pour the boiling water over the leaves- cover and steep for 10-15 minutes. Enjoy! I have been using plantain for years in a salve I make for skin irritations. I also infuse olive oil with plantain to keep plantain oil around. Even the youngest grand-kids know to ask for plantain oil or grandma’s cream when they have a bite, rash or whatever. The stuff grows wild in my backyard and I harvest as needed. Can the leaves be picked and refrigerated for later use? We are going to a heavily wooded area on vacation and I’m not sure if there is plantain weed growing in the few grassy areas there. Yes! You should be able to chill, freeze or dry them for later use! I use the ground up leaf on fire ant bites works great! I rub some leaf on the bite right after I get bitten and after just a few minutes it is like I never got a bite. Thank you for this post. When my eldest daughter was born, she was covered in eczema. The doctor told me she would have it for life and that I should use cortisone which was “very safe”. I just knew that this was wrong and my first voyage into the alternative world was to find a safe, effective alternative. I found this in the form of plantain cream and have never looked back. When hiking you can use one of the leaves on sore spots on your feet to prevent blisters from forming or to treat blisters. Just put it on the affected area inside your boot and leave it on. Change it out frequently. The “skinny” leaf variety of this plant is used to make a very effective cough syrup in my native Germany.